Baseball kind of dropped off the face of the earth for me for a while. I’ve spent most of my 23 years on this earth as a fan of the New York Mets, despite an earlier attempt at revolting against my mom (who loves the Mets, and convinced me when I was five that she wrote “Meet the Mets”) with the Minnesota Twins, I became – as many are – true to the orange and blue. 1999 and 2000 were a huge part of forming me as a sports fan. I used to listen to the games on radio every night, followed with Steve Somers and Joe Beningo recapping the game on WFAN afterward. I kind of fell out of love with sports in general during the year(s) of the first NHL lockout, in 2004-05. I focused on pretty much anything that didn’t have to do with sports, because anything centered on sports would make me think of my first love, hockey, and how sad I was that it wasn’t around. Also, I was in high school and crushing it pretty hard on the mock trial team (this is sarcasm because A. saying you’re crushing it in mock trial sounds awful, and B. our school’s mock trial team didn’t peak until the 2006-07 season, when we went to the county semifinals). I honestly don’t remember what the Giants or the Mets did during 2004 or 2005. For that reason, I didn’t entirely latch on to the Mets rebirth in 2006. I was a little put off by the free agent signings (Tom Glavine as a Met seemed like total blasphemy to start with, and the one thing I do remember about 2005 is that Carlos Beltran had been a disappointment). I remember watching a few of the playoff games, and I remember Endy Chavez’s remarkable catch in Game 7 of the NLCS, but it never resonated with me (or hurt me) like it should have. On the other side, the Mets 2007 and 2008 collapses didn’t hurt as much as they could have, either. By then, hockey was back, and I was burying myself into it like never before. The Mets slid further and further into oblivion, the Madoff scandal happened, and I went further and further down the hockey rabbit hole. But I remember noticing something along the way: the Mets were starting to become likable again. I had long ago made piece with Carlos Beltran before he departed, David Wright was always the perfect “face of the franchise” guy, and then R.A. Dickey showed up. Here is where we finally start to make the connection to the subject that I’m writing this to talk about. It was R.A. Dickey’s excellent book Wherever I Wind Up, that got me back on board with baseball and the Mets in 2012. If you haven’t picked it up yet, it’s stunningly good as athlete memoirs go, and as memoirs go in general. Dickey gave the Mets a real personality I could identify with for the first time in years, and I sort of rededicated myself to baseball. Of course, the consequence of that is the Mets’ awful second half being more painful than anything I’ve felt in a while. But it felt good to feel that bad about something, strangely. It makes sense, then, that a book is what closes out a fun baseball season for me (which ended with a trip on the Subway to see Dickey’s 20th win against Pittsburgh). 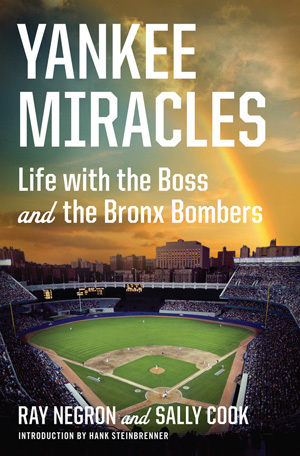 Yankee Miracles is the story of Ray Negron, who, as a teenager, was discovered by George Steinbrenner attempting to spray paint the outside of Yankee Stadium. This, remarkably enough, led to the legendary ‘Boss’ of the Yankees giving him a job as the Yankees bat boy, which led to him getting drafted by the Pirates, and eventually rejoining the Yankee organization. I’m a big fan of chance in stories like this. Negron goes on, in a way, to be sort of the Forest Gump of the Yankees organization, relating stories about Thurmon Munson, Billy Martin and all the way through to a particular eye-opening (if brief) chapter about Alex Rodriguez. He and co-author Sally Cook tell the story in a way that is sensitive, but never overly sentimental. Some of the stories (especially from the 70’s) have comic elements to them, but the authors are never afraid to give the reader something sincere. As far as great sports stories go, this one has an almost earnest, cinematic feel of older movies. A true redemption tale. It is, in that way, much like Dickey’s book. Dickey’s redemption came at a much later time in his life, but the pages read the same: misfits, found by someone who saw something in them, which helped them find the greatness within. It was a heartwarming, perfect way to cap off a year in which I remembered just why I fell in love with baseball in the first place. Hello. The headline says it all. Puck the Media is no longer an independent entity after nearly four years of existing in this format. This is the new Puck the Media. Though it is not necessarily it’s own website (it will be a section of SB Nation’s main NHL site), you will be able to access it via PucktheMedia.com. Try it now, go ahead. You’ll see new material there starting Thursday. Very little will change. There will still be tons of ratings info, and announcer listings, and all that good stuff. There will be so much more. I have been credentialed to cover the 2012 Stanley Cup Final, and will be assisting SB Nation’s Travis Hughes in tag-teaming the site’s Stanley Cup coverage. I couldn’t be more thrilled that I’ll be able to cover the games from both a hockey and ratings standpoint. It’s quite the dream come true. That said, Puck the Media itself will remain hockey media, and you’ll see all my other stuff on the regular SBN NHL website. There will be a lot more opinion on the new site, but there won’t be much of the bloat (i.e. press releases) that would fill space over here. The result is a lot better situation for both you, the reader, and me, the writer. There are a lot of people I think deserve thanks at this moment. First and foremost is Greg Wyshynski, who has been both a friend and mentor since I was about 16 years old and he found me through a Devils message board (homer). Through his advice and guidance – and more importantly, linking to this webspace – he made this a site for people to go to. There are so many people that have their credibility in hockey writing/blogging because Wyshynski helped give it to them. I hope I remain good enough to stay on those headline posts. Travis Hughes also gets singled out, because he’s chosen to hire me, and I still owe him for the ride he gave me back home from the Winter Classic. I get the feeling he’s just piling up favors at this point, but he’s a solid man for a Philadelphian and I am very grateful. I also need to thank numerous PR people and folks at various networks, who have helped this place survive and thrive on their information. People like Schuyler Baehman (who helped inspire this) and the fabulous Kerry McGovern at the NHL, formerly Katie Bradshaw and now Leslie Byxbee and Meier Ravich at VERSUS, Chris McCloskey and Adam Freifield at NBC. James Lamont and Bryan Frenehy, who do the PR work for the CBC, Chobi Liang at TSN, and everyone at the multitude of publishing companies that have helped out. Thanks to some other people who have helped out in the past and present. Numerous writers, bloggers and broadcasters have been supremely helpful and kind when I was an annoying kid seeking advice or an interview. Many of them have provided that, and others have become just good friends. People like (and I hope some of you don’t have a problem being name-dropped) Mike Emrick, Pete Weber, John Forslund, Joe Beninati, Bob Harwood, Billy Jaffe, John Buccigross, Chris Botta, Eric Hornick, Chris Peters, Nate Ewell, Mike Chen, Paul Kukla, Sean Leahy, Barry Petchesky, Adrian Dater, Katie Baker, Ted Starkey, Sean Gentille, Ryan Lambert, Scott Wasilewski, Ken Fang, Ben Wright, Joe Favorito, David Sarch, John Fischer, Jim “Boomer” Gordon and everyone at XM Home Ice, the folks at Sportsnet 590 and everyone at Brady and Lang, Adam and Derek from The Pensblog, Jeff Marek, and Seth Rorabaugh. There are others. I’m sorry I neglected you. It took me two months to think of all these names. There are a lot of my friends and family members who really don’t care about hockey much (or at all) who would read this website just out of blind faith that their friend knew what he was talking about. Jimmy Mona, Patrick D’amico, Samantha Murray, Jim Moretto, Stacy Blauvelt, Daniel Iorio and others. Some of you know about hockey, and some of you do not care, thank you for reading either way out of friendship and loyalty. I appreciate it either way. I thank my parents, obviously. My dad reads the site a lot, and I guarantee he wouldn’t read it if it wasn’t any good. He has high standards. Plus, my mom woke me up for that radio spot I did this morning. This is very much going to be the same website it was before, just better and more efficient. It’ll still be the same voice and it will never be watered down, and there will be more access. It can only get better, right? I hope so. Please join me at the next gig, won’t you? There’s some business to take care of tomorrow. I will be on the Brady and Lang show on Sportsnet 590 in Toronto at 6:45 a.m. ET. There’s some stuff to announce, change is coming, and tomorrow will be the end of an era. There’ll be a post around 10 a.m. ET explaining it, and then we’ll all move forward. Thank you for your support of Puck the Media. The Eastern Conference Final took a dip in viewers in Game 4. Game 4 between the Rangers and Devils drew 1.26 million viewers on NBC Sports Network, drawing a series low. There is no comparison going back to last year, as Game 4 between the Bruins and Lightning was on NBC. The 2012 Eastern Conference Final has averaged 1.29 million viewers over three broadcasts on NBC Sports Network. This is down 16% from the first three broadcasts of the 2011 Eastern Conference Final on VERSUS, which averaged 1.5 million through games 1, 2 and 3. At least a 2-2 series will likely guarantee better numbers for Wednesday’s Game 5.